I always suggest to my translation students to work on improving their command of both source and target languages. One effective way of accomplishing this is to enlarge our vocabulary - with a focus on the words we encounter in our translation projects. Every time you translate something, take careful note of all the words that you are uncertain about of that leave you with some doubt: the words you are not sure what they mean, and those you know what they mean - but you don't know how to say the same in your target language. Use a dictionary to learn about each of these words: both a good monolingual dictionary of your source language and a bilingual dictionary of your source and target languages. Even better: use several source and bilingual dictionaries, both paper and online. Read in full the dictionary entries for each word - not only the subhead closer to the meaning suggested by your context, but all the rest of the entry, including different meanings and meanings marked as obsolete. If your monolingual dictionary gives a meaning that is not covered in your bilingual dictionary, start to research how that specific word and meaning could be translated. Take notes of the example sentences given in the dictionary, and think how you could translate them. Don't limit yourself at searching in dictionaries: consult also encyclopedias and other reference works. See how these words are used in context in a variety of situations. Online tools like Google Advanced Search and Google Book Search can be very helpful to see how the words you are studying are used in the real world, both in books and in web pages and documents. Be thorough, and keep careful notes. Remember that your notes can be the starting points for further research. Think about the words you are studying: what they mean in your source language and what their translation mean in your target language. How the meanings differ between the two languages (for example, a word in your source language may share a core meaning with a word in your target language, but other meanings that each word may have in one or the other language may differ), and how register, connotation and usage differ between the two languages. Keep on doing this, as much and as thoroughly as you can, and you'll see that your command not only of your source language, but also of your native language, will steadily improve. Very informative data for fellow translators. I've always been big on keeping notes, I hate to lose anything. Google Advanced Search is a great tool. When I was a beginning translator, I learned a lot by taking careful notes. This is our first trip to blog. As one translator to another, I appreciate the hard work and effort you have made with your website. I think it's important to teach young translators and your blog is doing that and so much more! Best wishes. 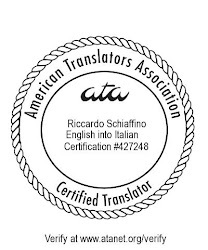 Hey Skrivanek Group I'm looking into getting my ATA certification, how often do you find yourself translating English as the source language? I'm fluent in Spanish but not sure if I'd be better off getting certified with English or Spanish the source language, any thoughts? I translate from English as source language all the time. Try to get certified in the language pair (and direction) you are most comfortable with. Hi Riccardo, thanks for sharing such a useful post. The suggestions on using dictionary to "dig deep" and the advice not to stop after we see the first meaning of the word in the dictionary is very important, as well as using other resources, besides dictionaries. Sometimes having a friend who is also a translator can be of assistance, allowing us to exchange experience and notes, and to discuss obstacles we all face when working on translation. I like the suggestions, exp 3, 6,7,8. It is an art and a skill that gets improved with practice and experience. Informative and inspiring write up!